'Pinocchio' is a platformer that was following in some very big footsteps. While it may have some of the best graphics on the Mega Drive did the gameplay compare? The video game industry seems to suffer from a perpetual need to return to the familiar. We see it today with a glut of first person shooters and in the PlayStation 1 era everyone seemed to be making variations of 'Mario 64' or 'Tomb Raider'. Even in the arcades of the late seventies and early eighties you would see one new idea surrounded by a dozen copies of it. It's easy to be critical of publishers for playing safe as they follow the tried and tested rather than exploring the new. But consumers are the ones at fault. If we didn't keep buying variations on whatever the latest trend is then the money men wouldn't think that's all we want to buy. In the 16 bit era the side scrolling platformer was the most over saturated genre, at least in the west. It was the go to type of game for licensed properties and as the years past reviewers were getting more and more tired of it. In an interview on the Maximum Power Up podcast reviewer Dean Mortlock summed up the feelings of the day. "The market's [appetite] was very different then; it was very dull. It was all about licenses for films and you get another [...] very very boring platformer and we were just a bit sick of it to be honest. There were very few original games coming through and for 'Lion King' we were like 'oh God not another one!'" "It was that sort of thing where you're thought 'this doesn't deserve my serious attention'" adds former Sega Power editor Andy Lowe. “If someone's just going to bolt a license onto another rubbish platform game, I don't see why they deserve our respect". It was this boredom and frustration that lead to Sega Power's infamous review of 'Lion King' written after taking LSD. But while Sega Power may have been the only magazine writing after taking hallucinogenic drugs, they weren't the only publication bored with a constant stream of Disney platform games. "I'm sick of seeing my favourite Disney movies turned into average platform romps" echoed Game Fan’s Dan Jevons. Most incorrectly presumed that 'Aladdin' producer David Perry was behind every Disney game Virgin produced, however he had left the company almost immediately after this game was released. For 'Pinocchio' to even stand a chance with influential reviewers the 24 strong London based development team had no choice but to convince them that this game represented something fresh. "This is not a 'Dave Perry' game" chief designer Dan Marchant insisted. "'Pinocchio' has been designed from the ground up. Apart from an all new engine, the game design aims to set it [self] apart from production line platformers. Each level of the game is designed to have a point or task rather than just a start and exit point." According to Marchant "the player is given choices, sometimes not obvious ones." 'Pinocchio' is arguably an odd choice for a video game adaptation. Obviously 1996 was a time before instant digital streaming, even predating DVD. Disney at this time restricted which films could be bought or even broadcast at a given time; with classic titles kept In "The Disney Vault". There was a chance that the child audience that typically were attracted to these sorts of games wouldn't have even heard of the source film. Earlier Virgin published Disney adaptations had hit the shelves to coincide with a VHS release of a Major animation film. Even 'The Jungle Book' Mega Drive game was following in the footsteps of a Walt Disney live Action adaptation of the original book. Sources suggest that the huge success of 'Aladdin' had made Disney realise just how much money was being made from video game adaptations of their films. This coupled with a desire for even greater creative control meant the house of mouse wanted to solely publish games based on their latest releases (even if they would continue to be made by external developers). "Basically Disney want to keep the rights to the 'super' films for themselves as they ramp up production of video games" Mean Machines Sega magazine once noted. Virgin instead turned to 'Pinocchio' hoping that the VHS re-release of the 1940 film would drum up public enthusiasm. "It helps that Disney are planning to release the feature again to buy on video for the first time in a limited edition” noted Marchant at the time. The classic animated film follows the emotional journey of wooden puppet Pinocchio who is granted autonomous life provided he remains "brave, truthful, and unselfish". However he is naively led toward debauchery and trouble by an anthropomorphic fox ironically called Honest John. Despite the best efforts of his conscience Jiminy Cricket, Pinocchio finds himself part of a circus, from which he runs away to a fairground to engage in a bit of drinking, smoking and gambling. In the films exciting conclusion Pinocchio rescues his father Geppetto from the stomach of a whale called Monstro; a selfless act that earns him the right to become a real boy for good. 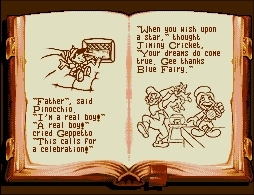 "'Pinocchio' provides as good a plot for a video game as any other Disney title” noted Mean Machines Sega. "There's plenty of danger and drama, lessons to be learnt and a wonderfully charismatic central character." "It's almost like Walt [Disney] foresaw the concept of video games" adds Marchant. The narrative is propelled by beautifully realised story book intermissions. "They know how to make a great movie, but we have the experience with games" states designer Dan Marchant. "Nevertheless, the 'Pinocchio' property is one of Disney's most precious and linking the game with as many elements of the movie is a priority. This is perhaps refreshing when considering the amount of past movie licensed games of all types which have had very tenuous links with the action of their movie counterpart." The game follows the film's story fairly closely with each stage portraying a key scene from the film. "[we've tried] to fit in with the 'Pinocchio' story" Marchant insists. "An example is the marionette level. It's a classic moment in the film as Pinocchio launches into a production number of 'I've got no strings' abetted by a cast of puppets. We wanted to avoid just making a platform level with a stage background, as a stage is obviously small and it wouldn't make sense". 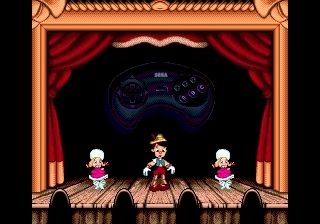 Instead, what developed from the film's musical circus scene was a dancing competition within the game. Like 'Parappa the Rapper' or other later rhythm action games, Pinocchio must mimic another puppet by pressing buttons in order. It's not that tricky and the game doesn't demand you remember too much, that is until the last round when Pinocchio has to perform a new move without the game telling you how to do it. The stage immediately becomes an exercise in trial and error as you’re forced to press random button in the hope you'll stumble upon the correct combination. It's frustrating but sadly indicative of most of the game. Each level may be different and varied but every single one has a frustrating element that makes 'Pinocchio' on the whole pretty frustrating to play. The opening level is standard platforming fare as you guide Pinocchio through town on his way to school, evading angry geese, bullying truants, and the distractions of Honest John. Pinocchio can't attack at this point in the game though, so you have no choice but to avoid dangers. Fortunately our hero seems largely indestructible and can take over 20 hits before dying. 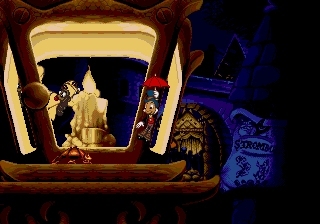 The real problem with this stage is knowing where you're meant to be going as at no point is it made clear that you can step into some of the archways shown behind Pinocchio. I traversed the stage countless times (getting increasingly confused) until I discovered the way to progress entirely by accident. To make the stage even more convoluted, there's absolutely no consistency. Some background scenery you'll then think you can pass through is impenetrable. Once you've navigated through this maze like stage you're presented with two almost identical doors but picking the wrong one leads to instant death and a level restart. It wasn't until my second play of the level that I realised that above the two doors reads "school" and "easy street". Despite the fact that Pinocchio takes the latter option in the film, if you wish to progress in the game you must chose the academic route. In the next level, you take the role of Jiminy Cricket. In this stage he chases away moths and other insects from a lamppost, presumably because he is sitting on it to watch Pinocchio perform in Stromboli’s puppet show. While it's great to play as a different character, the stage is so short and repetitive it feels like a mini game. It's also so easy it feels impossible to fail. In a level that follows the player will have to navigate a section of rising balloons which consists of nothing but leaps of faith to off-screen targets. But if this wasn't aggravating enough, the reward for success is a ride on a roller coaster in Pleasure Island. This is a stage clearly influenced by the mine cart section of 'Donkey Kong Country' and poses a much bigger challenge to the player. While there may be instructions telling the player what action to take, they wizz by so fast that they're illegible. Success depends on memorisation and burning through all the extra lives you've accumulated on earlier easier levels. After this you're expected to trudge along the ocean floor in search of Monstro and then you leap between platforms in the belly of the beast. These levels are once again more traditional platform stages but in between them are race sections. In the first you propel yourself by clinging onto fish and the final level sees Pinocchio and Geppetto escaping Monstro atop a raft. Both stages play like the speeder bike sections of 'Battletoads' and like this game they're brutally unfair and ridiculously hard. It's strange that half the levels of 'Pinocchio' are clearly designed with younger gamers in mind; short, simple, and almost laughably easy. In these it's practically impossible to die whereas in the “vehicular” levels (like the roller coaster and raft sequence) it's almost impossible to survive. The game is wildly inconsistent but at least it's consistently attractive. Like every Disney adaptation since 'Aladdin', part of the licensing agreement required the involvement of Disney Animation Studios. "One of their staff sitting in on discussions was the animator for Jiminy Cricket in the movie, his first animation job" recalls executive producer Tony Fagelman. 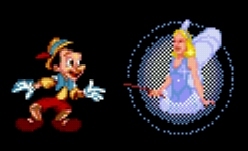 Fortunately Virgin had by this point published three games with Disney and the 'Pinocchio' team had established techniques at their disposal. Once again “DigiCel technology" was used. This meant individual frames drawn by Disney animators were scanned and then tidied up and coloured by the game's graphic designers. Westwood had perfected spite compression for 'The Lion King' which meant a larger number of sprites could be squashed onto a Mega Drive cartridge without a loss in quality. 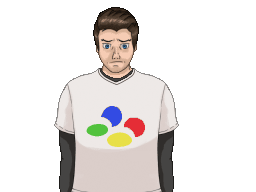 "The needs of the animators and programmers must be balanced" Fagelman said in a preview article for the game. "'Pinocchio' will have 2000 [frames of animation] a lot by Mega Drive standards but even that could have been easily consumer by Disney for the main character alone. The game has 31 characters to fit in the allocation, more than twice the amount in 'Lion King' with Pinocchio himself taking more than a quarter of all frames". The result of this meant ‘Pinocchio’ is much more reflective of the film on which it was based. 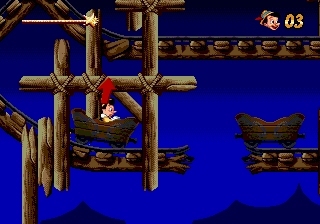 The game looks glorious, with Pinocchio moving through the levels with a fluidity not often seen in 16bit games. "When the game opens he skips lightly but as the plot places him in peril new animations show his change in mood" boasts Marchant. Despite the limitations of cartridge storage I find it impressive that part way through the game Virgin saw fit to change the main Pinocchio sprite. The wooden puppet grows donkey features, reflecting the physical change seen in the film. The backgrounds too look like the watercolour backdrops of the movie with the many layers of parallax scrolling echoing the muti-plane camera technique that was pioneering in the original 1940 film. While no one could claim the Mega Drive game is ugly, 'Pinocchio' on the Super Nintendo trumps it in every way when it comes to the visuals. 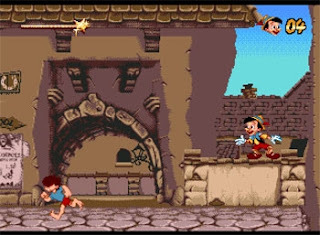 The machine's greater colour palette has meant a much more vibrant game, with large foreground objects passing in front of Pinocchio making the protagonist look immersed in the world. That being said critics still heaped praise on the graphics seen in the Mega Drive version. The game itself didn't find much critical appreciation though. Mean Machines magazine called it a "mixed bag of game styles. A modest platformer with only a few nice touches". "I wouldn't have it in the house" adds reviewer Dan Jevons . Clearly Virgin have tried to make the game as varied as possible; a conscious decision to make 'Pinocchio' different to 'Aladdin’, ‘Jungle Book' and 'The Lion King'. But the problem is that the individual levels aren't that much fun to play. The platforming stages are at best monotonous and at worse a chore to play. While chief designer Dan Marchant seemed so proud that they weren't using the 'Aladdin' game engine, when the end result is a greatly inferior game you kind of wish they had. Yes the nineties game market was saturated with platformers, but having another game like 'Aladdin' really wouldn't have been the end of the world given that Dave Perry's Arabian masterpiece is often called the genre's best. Reinvention is a gamble and in this case all 'Pinocchio' does, is remind us how good the games before it were. Like a 16 bit console's game catalogue my shelves are stuffed with Disney Platform games, to the point where I thought I may as well seek them all out. I've become increasingly fascinated by the internal workings at Virgin at the time and it's a shame that their last Mega Drive game with Disney was certainly their weakest. I picked my copy up on eBay although 'Pinocchio's lack of sales at the time means there is less to buy second-hand now. This naturally means an inflated price tag.